The index opened positive above 8800 and went on to make a high around 8840 but say huge selling pressure in the second half to move to the lows of the day at 8751 but closed just positive at 8767.25, small gain of 5.15 points. The broader market though was weak, with 610 advances to 897 declines. Range as per Option Table for Expiry comes to 8700-8900. Call option 8750-8800 added huge 11.78 lacs OI with profit booking seen at 9000 and above strike prices. 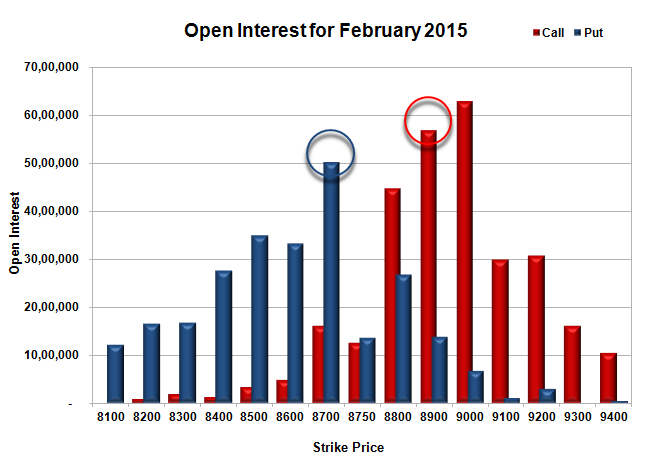 Put option 8750-8500 added huge 12.46 lacs OI with short covering seen at 8800 and above strike prices. Nifty Open Interest is at 93,56,850 down by 33,41,600, whereas March series added 43.97 lacs with no change in price, 100% rollover with huge short build-up. Bank Nifty Open Interest is at 17,36,175 down by 2,45,175, whereas March series added 4.39 lacs with decrease in price, 100% rollover with huge short build-up. FII’s sold huge 8.55 lacs Futures, which includes 52651 contracts long build-up and 86856 contracts short build-up, with increase in net OI by 139507 contracts (includes 297242 longs to 331447 shorts for the day) and the Average Price comes to 8890.55. 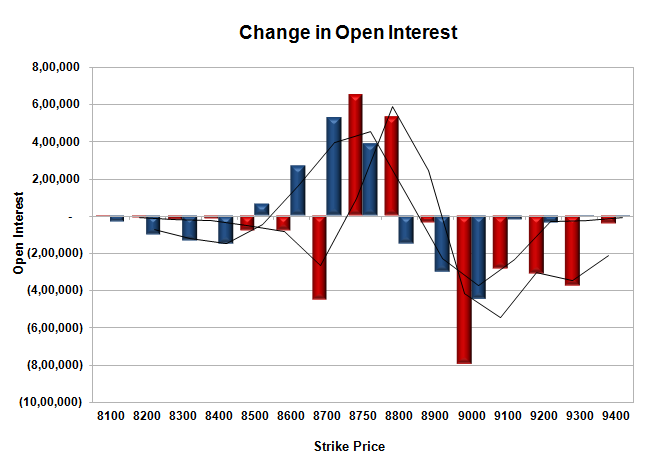 FII’s Index future open contract as on date is 839500 Longs to 260388 Shorts, net long 579112 down by 34205 contracts. Initial and best support at 8700, with OI of 50.24 lacs and below that at 8600 with OI of 33.29 lacs. Initial resistance at 8800, with OI of 44.80 lacs and above that at 8900 with huge OI of 56.95 lacs. 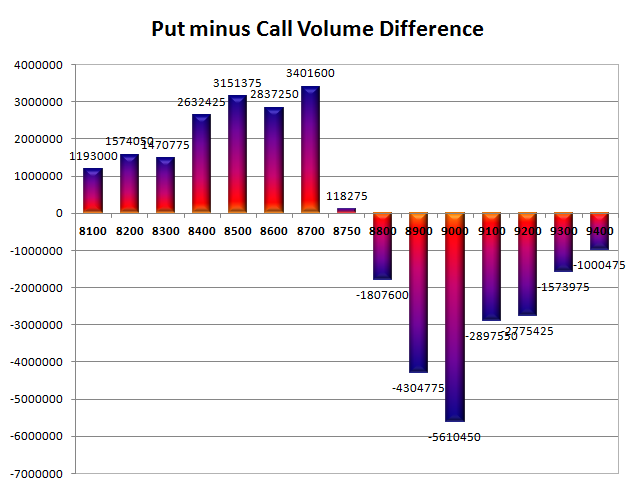 Day Range as per Option Table is 8708 - 8857 and as per VIX is 8672 - 8863 with 8786 as the Pivot.